Today, the Korean War Commemorative Silver Dollar Coin remembers the first jet airplane to jet airplane dogfight on November 8, 1950. American pilots today won history’s first death battle of jet planes—fought at a breath taking 600-plus miles an hour. A United States F-80 Shooting Star jet shot down one Russian MIG-15 in a five-minute battle. Another Communist jet was damaged badly. Identity of the Communist pilot was not determined. No American planes were damaged, headquarters said. The battle was waged at 20,000 feet near Sinuiju in Northwest Korea—across the border from Red Manchuria. Lt. Russell Brown, pilot of the Shooting Star which knocked down the MIG-15, said it exploded. The fight involved four United States F-80s and five to seven MIG-15s, Maj. Gen. Earle E. Partridge, 5th Air Force commander said. Maj. Evan G. Stephens, flight leader, said he chased the damaged Russian-made jet, but it escaped across the Manchurian border. Maj. Stephens said the Communist jets “seemed to want to get us across the border and gave no indication that they really wanted to fight on our side.” American planes are under strict orders to remain on the Korean side. “We had been strafing gun positions at Sinuiju when the appearance of enemy aircraft was first reported by our air defense controllers,” said Maj. Stephens. Lt. Brown was flying on his wing. A second element composed of Lt. Ralph N. Giel and 2nd Lt. Richard D. Escola, was several thousand feet below. “When Brown and I reached 20,000 feet I sighted from eight to 12 MIG-15s about 30 miles south of the Yalu River,” Mr. Stephens said. “Two of them were pulling up out of their dive and turning toward the river at exactly our altitude. I called to the rest of my flight to come on up—that we had two of them cornered. Lt. Brown said the first MIG, which dived out of range of Maj. Stephens, was closer to him. “I peeled off after him with full power in an almost vertical dive,” Lt. Brown said. “The MIG was diving at the same nearly vertical angle too. Both were doing more than 600 miles per hour. “The MIG was not pulling away from me but I wasn’t closing the gap. I was at extreme effective firing range. Maj. Stephens said he saw Lt. Brown’s MIG explode and crash on the east bank of the Yalu. Lt. Giel and Lt. Escola, at 20,000 feet, were giving Maj. Stephens and Lt. Brown top cover. None of the pilots saw any markings on the enemy planes. 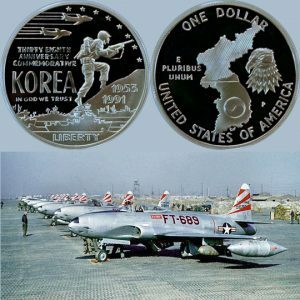 The Korean War Commemorative Silver Dollar Coin shows with a group of F-80 Shooting Star jets, circa 1950.